Is rest part of your normal day? Do these words bring tears to your eyes? Do you feel a deep ache at the thought of a “real rest”? Yet rest is not a luxury. It is an essential part of our make-up. If we don’t rest voluntarily, we will become ill—and rest will be forced upon us. In the New Testament of the Bible, Jesus says, “Come unto me, all ye that labor and are heavy laden, and I will give you rest.” (Matt 1:28 KJV). God, the Almighty Creator, needed rest. He worked for six days—then he took a whole day’s break. If God needed time out, I guess I do too. And you. My challenge for you right now is to choose a period of time, or even an entire day, out of the next seven days in this coming week, and mark it off on your diary or your calendar as “Time Out for Me!” And then stick to it. You’ll be surprised. The world won’t stop turning. You will return from your rest with more enthusiasm and inspiration. God took time out. He expects nothing less from us, His children. Why your life seems to keep spinning by? Do you fall into bed with a sigh? Do you long for the days when your time was your own? Then feel guilty for thinking that way? Yet they need you each second, all day. Do you wonder if God feels that way when you call? If He ceases to care what you do? He never takes time out from you. A question or three for you. Do you rest enough? What do you do to relax? Do you ever feel guilty when you take time out from the craziness of daily pressure? Leave a comment below and let’s encourage each other. In January, we celebrated my husband’s birthday. He was a year older than the same time the previous year. (Strange that!) Yet it seemed like only a few months since his previous birthday. What happened to last year? I find it difficult to believe that as I write this, we are already into the second month of this year! It doesn’t seem possible. I feel a bit like this little guy in the yellow shirt as he follows his brother. Trying to keep up. When I was undergoing aggressive cancer treatment, there were times when I longed for a tangible awareness of God. Oh there were many occasions when I did feel God’s presence, but other times? It felt as if I had lost touch with Him, and I seemed to struggle through on my own. One day I was reading my Bible and I came to that well-known passage. As I read the words, I allowed myself to dwell on the picture of the Lord as my shepherd. The shepherd in those days walked ahead and trusted the sheep to follow. If the Lord is my shepherd, that makes me a sheep. Yes, I could see the similarities, many of which I preferred not to dwell on. He makes me lie down, leads me, restores me and He guides me. Clearly the Lord was in charge. Just as well. I shuddered at the mess a sheep would make of things if he was in charge. When I reached verse 4, I paused. “Even though I walk through the valley of the shadow of death . . .” I identified with that picture too. It often felt as if I was in the shadow of death. Reading on . . . “Goodness and love will follow me . . .” (v. 6). Suddenly the words will follow seemed to stand out from the page. When I used to go for a walk with our little dog, she often trotted ahead, and I could see her in front of me. But she often lagged behind, determined to sniff at every little bush. Then I didn’t see her. I had to stop and look back to see if she was still following. Look at the picture. That shepherd doesn’t see the sheep that follow unless he stops to look back. Surely goodness and love will follow me all the days of my life, and I will dwell in the house of the Lord forever. I thought back to some of the difficult times of the past months, the times when I hadn’t been aware of God’s presence. His goodness and His love had followed me. God was there all the time, even when I hadn’t noticed Him. I’m sure we’ve all seen situations like the one pictured above. The little chap in the blue shirt is striding out with confidence. He cannot see his little brother struggling to keep up. The only way he will see his follower is if he stops and looks around. Every year end, my husband and I have a tradition. Near to midnight, we stop and look back. What has the previous year brought us? We think of the good times, and we think of the not-so-good times. What evidence is there of God’s intervention in some of the situations? How we marvel at the times He brought us through, sometimes with us resisting all the way. We end with a time of prayer and praise that even when we didn’t see Him, He was always there. His goodness and love followed us all the way through the year. Perhaps for you, last year was not an easy year. Maybe there were times when you felt alone. Now’s the time to stop where you are, and look back. Search for signs of God’s love and guidance, perhaps His protection and mercy. He was there all the time. Now move into this year with your head held high. No matter what lies ahead, God will be with you. We only need to follow. Do you want a book of similar meditations especially written for those in the cancer valley? Read here for further details. During my rigorous months of chemotherapy, one of my favourite haunts was the Walter Sisulu Botanical Garden not far from our home in Krugersdorp, South Africa. There we would sit and watch for the appearance of one or both of the Vereaux’s eagles that nested high on a cliff overlooking a rocky valley. I would marvel at their ability to rise and soar across the valley until they were mere specks in the sky. How I wished I could rise and soar over the valley of cancer. “In my distress, O LORD, I called to you, and you answered me. From deep in the world of the dead I cried for help, and you heard me” Jonah 2:2 GNB. Imagine the scene. Here comes Jonah, squishing along the beach. He’s covered in the stomach contents of a fish and smells of vomit. His skin and hair are bleached white from stomach acids. Seaweed drapes around his shoulders. This man has a message from God? You have to be joking! Yet amazingly, the people of Nineveh listen to this unlikely messenger. They repent and turn to God. At the beginning of my cancer treatment, I prayed that I would continue to be a witness to others of God’s love. But toward the end of the year my thinning hair looked and felt like straw. My complexion was so pale and spotted that my sons said I was “transparent.” My eyes were sunken because I had lost so much weight. I don’t think I looked quite as bad as Jonah must have looked, but I didn’t see how God could use me. Yet surprisingly, He did. Many people listened to what I had to say. They saw God at work in my life and asked questions about my faith. The Lord opened doors for me to write about my experiences so that others would be encouraged. 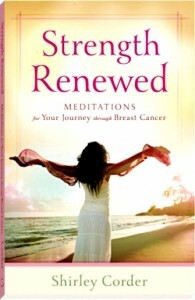 Years later I wrote about my cancer experiences in a book of meditations, Strength Renewed. Many people have contacted me to share how the Lord has spoken to them through one or more of the messages. Yet they don’t even know me. I am only the messenger. As I’ve thought many times about the story of Jonah and his terrifying fish ride, I have seen over and over again that it is not the messenger that makes the difference—it’s the message. Often when we are at our weakest, God can use us to spread His message of love and forgiveness. As writers, how often do we face a writing project that seems beyond our abilities? We believe God wants us to tell a story, but we don’t have the experience. Perhaps we lack the knowledge. We feel we’re too young. Or too old. Inexperienced. Not well enough known. Whenever you feel that way, remember the story of Jonah. And remember, it’s not the messenger that makes the difference. It’s the message. Well, we’ve finally had some rain in this drought-ridden land. Not too much, but some. Today it’s sweltering so probably soaking up most of the moisture in the air. Sigh. What I need is an ice-cold glass of fresh juice. I wish I had some grapefruit in the fridge. Talking about grapefruit . . . When did you last enjoy an ice-cold juicy grapefruit for breakfast? Yummy! I decided today that we’d learn something about the fruit, and also how to juice it. We’ve looked at reasons for doing a juice fast, and how to prepare your body for one. We’ve seen that there are some people who should never do a juice fast, and others who should do even the short 24 hour fast under medical supervision. Here are some more do’s and don’ts for you to consider. Once again, please do not undertake a juice fast of more than 24 hours without medical supervision or advice. If you’re on prescription medicine, speak to your doctor or other health professional before starting your fast. Fasting while drinking juice may reduce your blood proteins, which may affect the reaction of prescription drugs in your body. Do NOT skip your medicine without professional advice. Juice used in a fast should be freshly squeezed. Commercial products have a lower nutritional value due to the techniques used in preparation. Drink the juice as soon as it’s finished, or the enzymes will start to digest the other nutrients. If you add water, use filtered or purified water, or you could undo the effect of the fast. Do not use grapefruit juice during a juice fast, especially if you are on prescription drugs. Some research indicates that pomegranate juice may also have an effect on drugs so play safe and avoid that as well if you’re on medication. Don’t load your body with “fuel” the night before by eating a large meal. Rather eat a light, easily digested meal, such as steamed fish or chicken to ease your body into the fast. In addition to the fresh juice, aim to drink about six glasses of filtered water. This should be warm or room temperature–not iced. Don’t smoke, or drink alcohol during the fast. Again this will undo the point of your fast. When your fast is over, have a few complete meals before drinking alcohol. After your fast, start with easily digested food, such as soup. Come back next week for some side effects you can expect when doing a juice fast. You should assume that the owner of this website is an affiliate for some of the providers of goods and services mentioned on this website and may be compensated when you purchase. This is to save you the bother of finding links to follow if you want to look more closely at a product. If you do purchase, I will get a few cents and it will cost you nothing. Phytochemicals? How do I benefit the most from them? Why should I take phytochemicals? What good do they do me? People who eat a diet rich in fruits and vegetables are considerably less likely to develop cancers. When it comes to the immune-boosting power of fruits, vegetables and other plant-based foods, phytochemical is the latest buzzword. Phytochemicals are chemical compounds with long names such as lycopene and beta-carotene. Both of these occur naturally in plants. Medical Science does not necessarily recognize Phytochemicals for their nutritional value. The problem is that modern processing techniques, including cooking, may destroy phytochemicals. For this reason it is good to add raw plants rich in these compounds to our juicing whenever possible. This is one of the better-known phytochemicals. It is well documented for its strong anti-cancer properties. People take lycopene as medication for preventing heart disease, and many types of cancer. Instead of swallowing capsules, it makes sense to find it in nature’s medicine box. Lycopene is found in tomatoes and other red plants. So make a point of eating plenty tomatoes (including tomato sauce), papayas and watermelon. Check here for the nutritional value of tomato sauce! Who would have thought this? This phytochemical is one of a group of red, orange, and yellow pigments called carotenoids. It is found in fruits, vegetables, and whole grains. There is a strongly-held belief that smokers should avoid large doses of beta carotene. It is one of the carotenoids that our body converts into vitamin A (retinol) – and Vitamin A is one of the vitamins which can do us harm if taken in too high doses. age related macular degeneration (AMD). But medical experts recommend we get our Beta-carotine from fresh vegetables and fruit. The value of Beta-carotine supplements is still undetermined. How can I increase my intake of Phytochemicals? Are there any statements, or fruit and vegetables, on this list that surprise you? Please share in the comment box below. The time had come to commence radiotherapy. The one-hour drive into the Rand Clinic, a private hospital in the center of the notorious Hillbrow suburb of Johannesburg, went too fast. Rob and I prayed aloud in the car. Then we tried to keep up positive conversation. How much positive conversation can you think of on the way to the gallows? I wondered. It was almost a relief to spot the grey building of the hospital towering ahead of us. We drove through the litter-strewn streets and past the street vendors with their wares laid out on the pavement. We shook our heads negatively at the shifty-eyed hawkers who plied their goods at the traffic lights. Two outrageously dressed girls, who looked as if they should still be young, faces plastered with make-up, cheap jewelry hanging over black plastic jackets, seductively sauntered up and down the pavement. Their high-heeled black boots covered their knees and almost reached the hems of their diminutive skirts. “Are those what I think they are?” I glanced at Rob’s silhouette as he concentrated on the heavy traffic. When Rob and I had first married, we lived in a flat near here. “How the area has degenerated through the years,” I remarked sadly. My gaze was drawn back to the building ahead, as Rob maneuvered the car into the parking lot across the street from the main entrance. As we walked through the hospital entrance, I drew a deep breath, and held my head high. I can do this! Then—O Lord, help me through the next couple of hours! “Please could you direct us to the radiotherapy Unit?” As Rob asked the officious looking woman at the Inquiry Desk, I noticed her disinterested gaze moving from him to me. Guess the cancer patient, I thought wryly. What a fun game! We entered the lift, and pressed 6 on the lift panel. I felt if everyone was gazing at me, instead of watching the lighted numbers ticking off our ascent. One by one the passengers got out. Everyone, except Rob and me. I reminded myself that I was unique. They had never given radiotherapy to Shirley Corder, so I resolved to stay positive. Ping! The lift shuddered to a stop, the doors opened, and we caught our first sight of the room where we were going to spend a good deal of time. Rows of identical, upright, comfortable looking seats lined the walls of a long, cheerful room painted in pastel colors. Several tables stood under untidy piles of old magazines. To my left was a smallish reception area, with a number of busy ladies ignoring the lift and the newcomers. Hesitantly we approached them. Eventually a lady glanced my way and handed me a clipboard. “Please fill in your details.” With Rob’s help I filled it in, including all sorts of apparently irrelevant information, and took it back to the counter. I gave the lady a bright smile, hoping to receive one in return. From her expression I realized she didn’t consider this to be a smiling matter. She wasn’t the only one. In the corner stood a vending machine offering free coffee, tea, and drinking chocolate. How I longed for a cup of coffee. Surely, the fact that it stood in this room indicated I could help myself. Yet, I didn’t know what to expect. Could I drink just before the treatment? I didn’t want to do anything wrong. I looked at the frosty-eyed lady, and decided it couldn’t do any harm to ask. I looked in astonishment at the steely eyes, looking out through the empty window of the top half of her glasses. I realized she had misunderstood me, but I didn’t have the courage to try again. “Thank you!” What a relief to see a smiling face. I walked over to the vending machine and poured us both some much-needed coffee. I couldn’t concentrate on a magazine, so I stared at my shoes and allowed my mind to drift over the illustration of my war with cancer. In the next room there were machines that I’d never seen before. These were the artillery, and they were preparing for my arrival. I pictured those cowardly cells hiding in the scar tissue of my breast and resolved to tell the machines where to look for them. If you are facing radiotherapy (or radiation as it’s called in some countries) try not to be afraid of them, but to see them as part of the weaponry in your fight against cancer. They are not the enemy! They are there to help route out the enemy and restore you to health once again. How do you deal with suffocating fear? It doesn’t need to be a fight against cancer. We all have to deal with this terrifying emotion at one point of another. Please share your coping mechanism with me and with other readers. Last week we looked at the importance of antioxidants in our diet. Here is a delicious drink you can make, with a possible variety, which is exceptionally high in antioxidants. It is ideal as a pre-workout drink, or as a drink to enjoy after a work-out. It only uses a few ingredients so it is quick and easy to make. Use the shredded cabbage to make a tasty coleslaw salad (recipe at the end of the page).